In 1996 his first self-published book was issued under the pseudonym Angel Gorski. 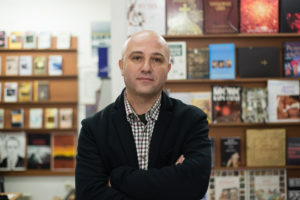 His official debut as a writer was in 2006 with the short story collection “Krotki Prikazni” (2006), which was the first publication from a domestic author in the PROaZA edition, and whose stories were published in a few literary magazines in the Balkans. Furthermore, his novels “Kraj-pat” (2010) and “Foto sinteza” (2013) had an excellent widespread reception and had re-editions. Angjelkov is known for his film commentary in the media as an author of the film radio show “REDRUM” on Kanal 103 ever since 1997 and of the film magazine “Filmoposlis” on TV Telma. He is a member of the international film critic organization FIPRESCI, and from this year, he is the program director of the International Film Festival „Kinenova“ Skopje. His oeuvre includes two journalistic works in the field of film art: “Film.mkd”, which won the State Publication Award “Mito Hadjivasilev – Jasmin” in 2016, and his latest work “Filmski Grad” (2018).